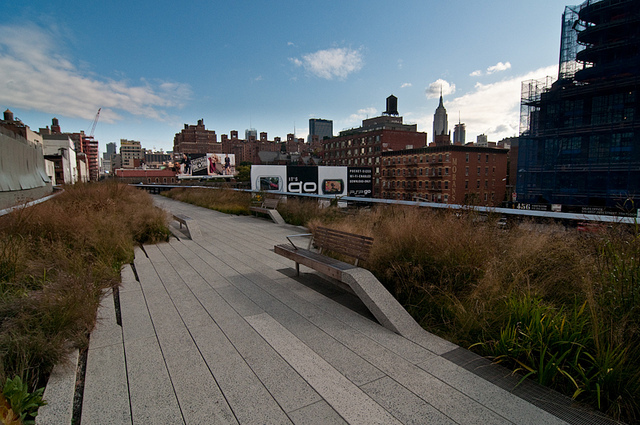 I recently visited the west side High Line for the first time. No one had really told me about it and I hadn’t even heard of it until I saw a feature talk by Robert Hammond on TED. 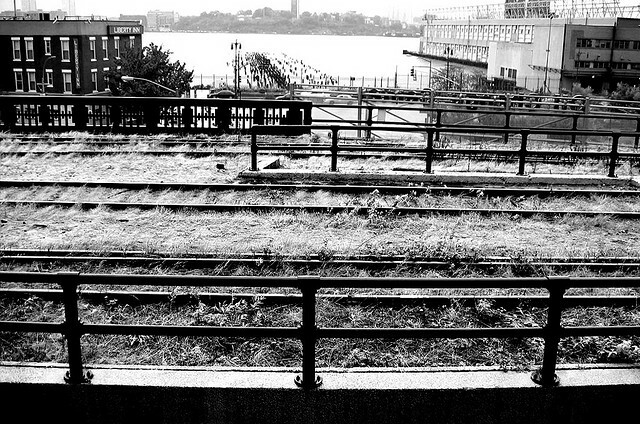 Hammond and co-founder Joshua David advocated for turning the High Line, which was built in the 1930’s to elevate freight trains running through the Meatpacking District, into a public park space. The first section, running from Gansevoort Street up to West 20th Street, opened in 2009. I must say it was one of the most beautiful ways I’ve experienced Manhattan. It was drizzling, gray, perfect. No battles with traffic or crowds or dirty rain puddles; I was finally waltzing above the city, not on an asphalt roof, or a tiny balcony, or the penthouse to an office building, but really being able to breathe in all the grimy glory of the West Side, from above. I could suddenly be a spectator to sidewalk smokers, trucks backing up into alleyways, the ghost piers on the Hudson River. And there was practically no one… a handful of German tourists, a mother and daughter on a day trip. On a visit to Brooklyn, Flo and I happened upon Cobble Hill, and I didn’t realize I’d actually been there until we passed by a bookstore I once visited called Book Court. It was back when me and Flo used to live in our brick house in Fort Greene that one summer after college. I decided to wander out of our neighborhood one Saturday and came upon Court Street, where I bought an ice cream and sauntered around looking into shop windows. This storefront was exactly how I remembered it, old-fashioned with benches for readers and ice-cream eaters. Although I believe they’ve moved the poetry section. As I peered through the shelves of books, remembering my last pleasant visit three years ago, flipping through literary journals and memoirs, I decided that I in fact did not want a Kindle for my birthday. I’d wanted one all summer. But being in that bookshop and seeing all those neighborhood events and ads posted on the staircase wall, the interesting chapbooks and new non-fiction books, made me think that I couldn’t ever fathom the disappearance of a place like that. I’ve spent so much of my time in libraries and bookstores, I’ve practically spent half my life reading. What was I thinking? Part of the whole experience of reading a book is coming across it at the Strand, or getting it as a thoughtful present, or waiting anxiously for its release. Not to mention curling up with it on the couch, experiencing the novel as it’s meant to be experienced: not just visually but viscerally. I’ve also had the life-long dream of collecting enough books to build my own home library of wall-to-wall bookshelves. So what if all the collected works of Shakespeare or Jane Austen are digitally free? I think I’d never be really satisfied until I owned the actual tomes, and they are sitting there on the shelf with all the other classics I’ve collected. I couldn’t believe upon coming home that the Philadelphia Borders had closed. If such a huge franchise like that couldn’t make it, what will become of places like Book Court? Housing Works Cafe…I somehow always run into this place every time I’m in New York, even though Crosby street in Soho isn’t exactly a street one would encounter easily. I’ve been here on rainy Sundays to take shelter. I’ve sat in the little cafe area with hot tea and a random book from the shelf, so delighted to be alone. I’ve bought used poetry books and novels, among them, I remember, Sylvia Plath’s The Bell Jar. Of course this time I had to go browse the small poetry nook found up the winding staircase. I came upon the same edition of Dylan Thomas’s collected poems that I had lost for some time now, a collection that has lived its meaningful moments during my time in college. Once a guy I was briefly and violently in love with (named Dylan) chose a poem randomly from that book and read it to me before I went to sleep. It turned out to be the best one in the whole collection, or at least I fell in love with it and have not fallen out ever since. Wow, I seem to have blocked Manhattan out of my consciousness. I was planning a possible lesson on modes of transportation throughout the boroughs of New York City. I had listed all the boroughs I could think of: Bronx, Brooklyn, Staten Island, Queens…. Yes, then I wikipedia’ed it and felt really stupid. But I do really miss fall in New York. And I do love Manhattan. And all those bridges that lead into it and out of it.